Syrian Rue (Peganum harmala) is a plant that since old times has been used to increase the effects of psychedelic substances. This 10x extract is 10 times more concentrated than Syrian Rue seeds. 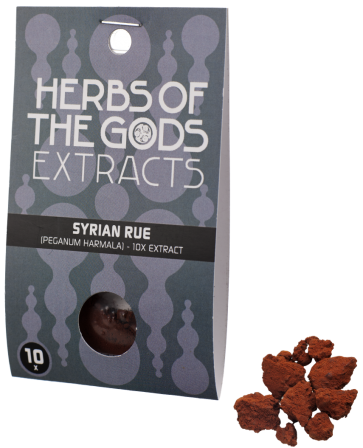 Contains 1 gram Syrian Rue 10x extract. In hermetically sealed packaging. The seeds of Syrian Rue (Peganum harmala) contain the alkaloid harmaline. Harmaline works as MAO inhibitor (MAOi, or Monoamine Oxidase inhibitor). Monoamine oxidase (MAO) is an enzyme that naturally occurs in our bodies. This enzyme breaks down neurotransmitters such as serotonin, norepinephrine and dopamine, but also psychoactive substances such as psilocybin, N,N-DMT and 5-MeO-DMT. Your body usually doesn’t absorb these substances when you consume them orally. Syrian Rue temporarily inhibits MAO, preventing your body from taking down these substances. This means that you can take substances like DMT orally when combined with Syrian Rue. Owing to its status as MAOi, Syrian Rue is often used as an ingredient for anahuasca or ayahuasca analog, as a replacement of Banisteriopsis Caapi. Anahuasca is a drink that mimics the effects of ayahuasca with an alternative composition and preparation. Many people prefer Syrian Rue over Caapi because the seeds are easier to prepare and the bodily effects (stomach aches, nausea, vomiting) are much less intense. Syrian Rue is mainly known as an MAOi and is most commonly used in tandem with other plants and substances containing DMT. Nonetheless, the seeds have some standalone effects, too. Syrian Rue is said to have some characteristics of antidepressants. It is also said to stimulate the imagination. Some psychonauts are experimenting with high doses of Syrian Rue to induce a trip. A dose of 0,2 to 0,3 grams should inhibit all MAO activity in your body for approximately 6 hours. There are risks associated with the use of Syrian Rue. The substance tyramine is also not broken down by your body after using a MAOi. When tyramine accumulates in your blood this can increase your blood pressure enormously (hypertension) up to dangerous levels. To prevent this from happening you must therefore ensure that you have as little as possible of tyramine in your food and drinks. It is strongly recommended to do a “MAO diet” at least 12 hours prior to the intake of Peganum harmala. Click here for a list of foods and drinks to avoid during your MAO diet. Click here for a list of medicines and drugs that should never be used in conjunction with Peganum harmala. Syrian Rue (Peganum Harmala) belongs to the family Nitrariaceae. It originates from warm, rather dry areas, being found from the Mediterranean and the Middle East all the way to India, Pakistan and even China. Syrian Rue has a very rich and ancient history. The plant is often linked to two legendary magical herbs: soma and moly. Soma was a herbal drink that in ancient Persia served as medicine and panacea. The identity of this magical drink is a historical mystery, but many scholars suspect that the psychoactive plant Syrian Rue could have been its main ingredient. Moly is a magical herb that figures in the Greek myths of the Odyssey. The god Hermes provides the hero Odysseus with moly to protect him from the witchcraft of the sorceress Circe. Historians aren’t sure which herb the Greeks were referring to with moly, but its description (a white flower with black roots) is reminiscent of Syrian Rue. Syrian Rue is part of rituals and folk medicine almost everywhere where it can naturally be found. In India and Pakistan, the plant has many gynecological uses. It serves as a treatment for menstruation pains, to alleviate the discomforts of labor and as an aphrodisiac. In Iran and Iraq, Syrian Rue seeds are thrown into fires to ward off evil spirits. In North Africa, the smoke of Syrian Rue is inhaled as a cure for headaches, venereal diseases, and as a way to expel the “evil eye”.